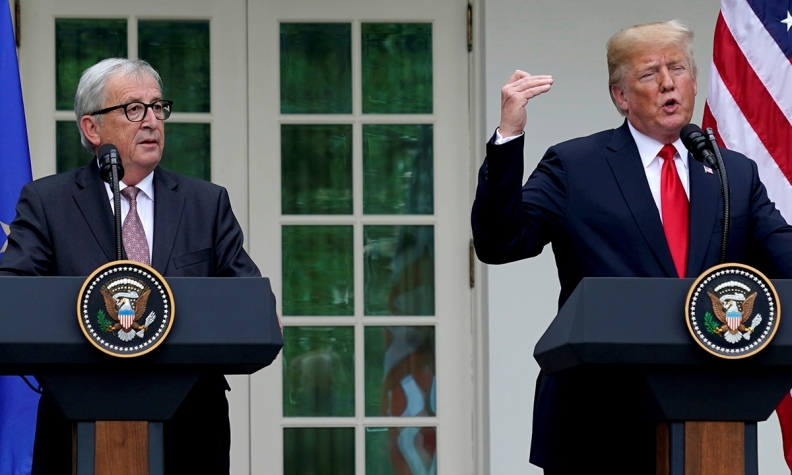 Trump and Juncker, left, address reporters after meeting at the White House to discuss trade. WASHINGTON - In what the EU chief called a "major concession," U.S. President Donald Trump agreed on Wednesday to refrain from imposing car tariffs while the two sides launch negotiations to cut other trade barriers, easing the threat of a transatlantic trade war. After a meeting at the White House, Trump and European Commission President Jean-Claude Juncker said the talks would also seek to "resolve" U.S. tariffs on steel and aluminum and Europe's retaliatory duties - marking a step back from Trump's signature import protections for American metals producers. Europe has agreed to increase purchases of U.S. liquefied natural gas and lower trade barriers to American soybeans, aiding U.S. farmers and the energy sector, Trump said. "Soybeans is a big deal. And the European Union is going to start, almost immediately, to buy a lot of soybeans," Trump told reporters after the meeting. Trump later tweeted that work on documents was "moving along quickly," adding that the meeting with Juncker had "great warmth." "A breakthrough has been quickly made that nobody thought possible!" Trump wrote, marking a turnaround from July 15, when he called the 28-nation European Union a "foe" on trade. He later told reporters that was a "major concession" on Trump's part and that he expected the U.S. president to follow through on it. U.S. import tariffs of 25 percent on steel and 10 percent on aluminum imposed in March will remain in place during the talks, but Juncker said: "It is the first time that the Americans agreed to reassess the measure that they have taken in the steel and aluminum sector." European governments and EU officials hailed the Trump-Juncker agreement as a major success. "Breakthrough achieved that can avoid trade war and save millions of jobs! Great for global economy," tweeted German Chancellor Angela Merkel's economy minister, Peter Altmaier. The Alliance of Automobile manufacturers, a trade group representing both domestic and foreign-brand automakers, welcomed the agreement to hold talks instead of impose tariffs, saying the announcement "demonstrates that bilateral negotiations are a more effective approach to resolving trade barriers, not increasing tariffs." Trump has threatened to impose 25 percent tariffs on auto imports, a move that would hit European carmakers such as BMW and Volkswagen hard, as well as Japanese and South Korean car companies. An EU official said there was significant pressure from Trump administration officials to increase EU soybean purchases as part of any trade deal. U.S. farmers have been hurt by China's retaliatory tariffs on American soybeans amid an escalating trade fight between Washington and Beijing, and Trump has been promising relief. On Tuesday, his administration said it would use a Depression-era program to pay farmers up to $12 billion, easing the pain for a politically important Trump constituency. Juncker said the United States had agreed to build more LNG export terminals to increase supplies to Europe. "They are going to be a massive buyer of LNG, so they will be able to diversify their energy supply," Trump said of Europe. "And we have plenty of it."